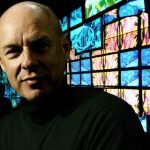 When you think of clocks that announce the time, talking dolls or audio courses, there isn’t much in common between them on the surface of it. However, each of these owe a lot to Thomas Edison and his favourite invention – the phonograph. It was while he was working on improvements to two of his other inventions, the telegraph and the telephone, that Edison figured out a way to record sound on tinfoil-coated cylinders. In 1877, he gave a sketch of the machine with two needles: one for recording and one for playback to his mechanic, John Kruesi, to build, which happened within 30 hours. Edison discovered that when he spoke into the mouthpiece, the sound vibrations of his voice would be indented onto the cylinder by the recording needle. And then he spoke the first ever words that would be recorded – “Mary had a little lamb.” Edison did not file for a patent until December 24, 1877. A year later, he established the Edison Speaking Phonograph Company to sell the new machine. He suggested numerous uses for the phonograph in the North American Review in June 1878, including letter writing, dictation, phonographic books for blind people, a family record (recording family members in their own voices), music boxes, musical toys, clocks that announce the time, and a connection with the telephone so communications could be recorded. So many of these uses have become a reality today. At the time he invented the phonograph, interest was high and the invention was covered in several New York newspapers, and later in other American newspapers and magazines. The Edison Speaking Phonograph Company also sought to exhibit the new machine with Edison received $10,000 for the manufacturing and sales rights and 20% of the profits. Since it was a novelty, the machine was very successful, but was difficult to operate except by experts, and the tin foil would last for only a few playbacks. Eventually the fascination with the invention wore off for the public and Thomas Edison began focusing on developing the light bulb. Other inventors such as Graham Bell spent the 1880s making improvements on the phonograph, and eventually, in 1887, Edison turned his attention back to it. Greatly improving the machine, he named it the Perfected Phonograph, and it now used recordings engraved onto wax cylinders. 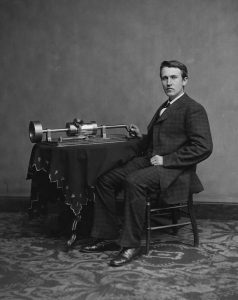 Edison began marketing recordings of music and recitations, and the new business slowly caught on. In 1890, Edison marketed talking dolls which had a small phonograph machine inside them. Most of these dolls malfunctioned and the business became a disaster. 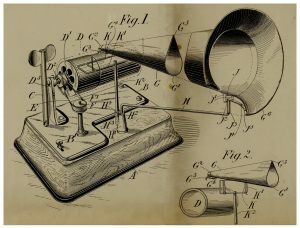 By the late 1890s, Edison phonographs began to flood the market and the machines which had cost approximately $150 a few years earlier, dropped prices to $20 for a standard model. The early Edison cylinders could only hold about two minutes of music. But as the technology was improved, a great variety of selections could be recorded. And the ability to mass produce cylinders meant the recordings could get out to the public. In 1917, when the U.S. became involved in World War I, the Edison Company created a special model of the phonograph for the U.S. Army, selling this basic machine for $60. Many Army units purchased these phonographs because it meant a lot to the soldiers to have music to cheer them and remind them of home.